The centers and downtowns of Connecticut communities have traditionally served as the focus of the community. Connecticut towns were established around their churches, located on or near the Town Green. Commercial establishments followed, and town centers developed. Over the years, the role of the town centers changed and evolved. In some communities, the town centers evolved into “downtowns,” serving commercial, community, employment and spiritual needs of the residents. In other communities, the role was more limited, sometimes only serving a limited commercial and community role. The importance of the Town centers was diminished during the latter half of the twentieth century. The growth of Connecticut communities during this period was based upon almost universal access to automobile transportation. The growth of commercial services occurred in locations and sites that were convenient for automobile access and parking. Traditional town centers usually lacked this convenience, and their role as the commercial focus of the community diminished. Commercial development occurred along major roads and, where it was possible to provide ample parking. However, in recent years there has been a renewed interest in community centers. Many communities have recently realized the importance of a focus or center as a determinant of the character of the community. Communities have also realized their importance as an economic resource, both as a source of commerce and as a community attraction. The role of Oxford Center has evolved within this general context. In contrast to its more urban neighbors, such as Naugatuck and Seymour, Oxford has remained a rural community and was never a center of commerce or production. Oxford has experienced rapid residential growth over the past several decades. However, given its large geographic area, and rural heritage, the growth has been scattered across the community. Commercial development has occurred in Oxford to partially serve this growing population, but none of it has been in Oxford Center. Even with a population of almost 11,000, Oxford residents still obtain a vast majority of their retail goods and services outside of the town. However, Oxford Center has remained the governmental center of the community, with the Town Hall, Library, Police Station and currently expanding Center School. Unlike most town centers, Oxford Center has a distinctly residential character. The residences are interspersed with churches, with municipal uses anchoring the west side of the Center. Oxford Center is linear in nature, stretching approximately three-quarters of a mile along Route 67. The southeastern entrance is Victory Park and the intersection of the Old State Highway, with the Town Hall defining the northwestern edge. As small as the Town Center is, it contains three distinctive land use areas which were used in the analysis and formulation of this plan, the Southeast Gateway, Historic Core, and municipal area. Each has its own distinctive character and subject to different land use factors. The Southeast Gateway is the area from Victory Park to Riggs Street. It is somewhat separate from the rest of the Center and is the least developed area. The Historic Core is centered upon the Green, including the churches and relatively intensive residential uses. The Municipal Area includes the Town Hall, Center School and Fire Station. Victory Park defines the southeastern entrance to the center. The park consists of a narrow stretch of land along the Little River between Route 67 and Old State Highway. Access to the park is difficult from Route 67 with the best access from Old State Highway. The park is somewhat separated from the rest of Oxford Center by the intersections of Route 42 and Riggs Street. There are several homes on the north side of Route 42, just east of the intersection of Route 67. The realignment of the intersections of Route 42, Riggs Street and Route 67 created a small parcel of vacant land on the northeast side of Route 67, between Riggs Street and Route 67. There are additional residences to the northwest along the road towards Dutton Road. The property across from the intersection of Dutton Road is vacant. Although a portion of it is within the floodplain of the Little River, most of the property is useable. Saint Peters Church is on the other side of Dutton Road, separated from the Oxford Police station by a small parking lot. Governors Hill Road intersects Route 67 just northeast of the police station. Several residences are across the road from the church and police station, up to the Town Green. At this point, the Little River is just behind the properties fronting on the southwest side of the road. The Town Green is on the northeast side of the road. Academy Road surrounds and frames the Green, linking it with the surrounding residences and the Congregational Church. The Oxford House Restaurant is across the road from the Green, with a parking lot along the road. There are several other residences on the southwest side of the road. At this point, the Municipal Area of Oxford Center begins. There are only two privately owned uses on the southwest side of the road, a residence, and an attorney’s office, across from the Town Hall. Much of the remainder of the area on this side of the road is town owned space. It was part of a residential subdivision that was dedicated to the Town. An effective development plan for any area or neighborhood requires a certain consensus on the overall vision. An understanding of the underlying strengths, weaknesses, opportunities and threats that impact the area is necessary in the formulation of this vision. A meeting was held with the stakeholders committee to identify, discuss, and assess the strengths and weakness of Oxford Center. The growth of Oxford over the past several years has had little impact upon the historical character of the area. This has resulted in a minimal impact upon the area’s historic character. The Upper Green is the central focus of this historic area, bounded by the Congregational Church, and historic homes. The historic character of the area is also enhanced by the Oxford House, the Grange and the historic homes and churches that line Oxford Road between Riggs Street and the Center School. Although there are mid-twentieth century homes in the area, the overall historic character has been retained. The Little River runs through Oxford Center, closely paralleling Route 67. Within the northern part of the study area, the river is close to the road. As it flows south, the river winds to the south of the properties on the south side of the road. It crosses Route 67 just south of the intersection of Riggs Street, and forms the heart of the Lower Green. The Little River has important town wide significance, as well as it defines the “central valley” of Oxford. 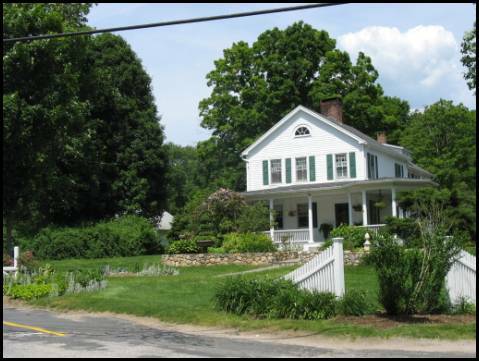 Oxford Center has retained many public owned spaces that are available for the enjoyment of the citizens of Oxford, including the Upper Green, Lower Green, Town Hall and Kirk’s Pond, Center School and the recently acquired open space across the street from the Town Hall. These properties are all under direct control of the Town and can be used for public benefit. Oxford Center is literally located within the center of the town, astride the most heavily traveled road in the community. Route 67 links Oxford Center with the south end of Oxford and Seymour to the south, and into Southbury on the northwest. According to the State Department of Transportation, approximately 13,000 vehicles per day pass through Oxford Center on Route 67. The Grange Building, located just southeast of the Town Hall, was an important focus of Oxford’s agricultural community. Although the role of agricultural in Oxford has declined, the Grange still serves as a community meeting space. Oxford Center has remained as the civic and governmental center of the Community. The S.B. Church Town Hall was constructed approximately thirty years ago on the north edge of Oxford Center. The Library is in the basement of the Town Hall. The Oxford Center Fire Station and Center Elementary School are adjacent to the Town Hall, and the Police Station is across the street. Over the years, the public and civic role of Oxford Center has remained its most important function. Municipal business is conducted in the Town Hall, and students and teachers use the Center School. 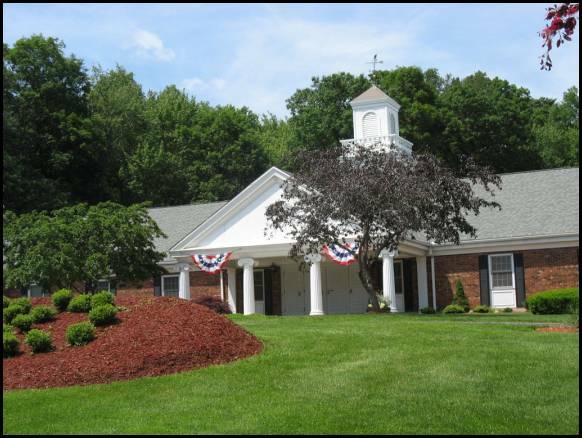 Although expansions and additions to the municipal facilities will be needed in the near future, it is important that Oxford Center retain its role as the municipal center of the community. Kirks Pond is located immediately adjacent to the Oxford Town Hall, just behind the Grange building. The lower front Town Hall parking lot is just west of the pond. 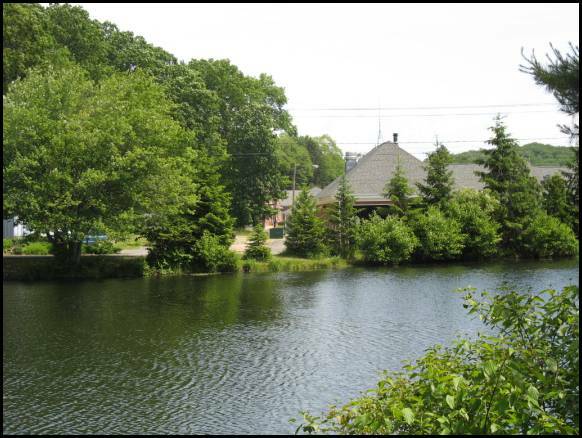 Although it is located within the complex of municipal buildings, Kirks Pond has a low visibility and utility. No building or public spaces are oriented towards the pond. However, with changes, the pond has the potential to serve as focus for park or public space. Although the visibility of Oxford Center is strength, the volumes and speed of traffic traveling along Route 67 detract from the environment of Oxford Center. The traffic volumes have been steadily increasing due to increased development in Oxford and surrounding communities. Perhaps more significant than volume is speed, and the traffic maintains its speed as it travels through Oxford Center. There are no traffic signals, stop signs, crosswalks or any other traffic control devices that cause the traffic to stop or slow down. Although the speed limit in Oxford Center is 25 mph, few vehicles appear to slow down to that speed. As a result, the overall feel and impression of the area is that of land along a highway. With increased residential and commercial development projected in Oxford and surrounding communities, traffic on Route 67 will continue to increase, which is likely to result in the need for future road improvements. The intersection of Route 67 and Route 42/Riggs Street was improved several years ago to accommodate the increased traffic to be generated by the Oxford Greens residential development. However, as more development occurs along Riggs Street, and there is more traffic along Route 67, additional intersection improvements are likely to be needed in the near future, possibly including a traffic signal. The major difference between Oxford Center and other, more vibrant town centers is that Oxford Center lacks a strong “sense of place.” A “sense of place” is the perception of the geographic area as containing features or characteristics that define the area as recognizable, cohesive, and distinctive. This sense of place can manifest itself in a strong focal point, such as a town green, or prominent building, but it needs to contain elements that tie the area together. Currently, Oxford Center is a collection of related buildings along a stretch of highway, but lacking unifying elements. Aside from the municipal buildings, the churches are the most significant uses within the Center and generate the most activity. Both churches lack adequate parking, particularly for the major holidays or events. On-street parking is not an option. The parking lots at the Central School and Town Hall could be used by the church attendees during periods in which there would be little or no need for municipal parking. However, this is difficult as there are no sidewalks, and no way in which pedestrians can safely and conveniently walk from the municipal parking lots to the churches. Oxford Center is within a narrow valley of the Little River, with steep hillsides on the south side of the valley, separating the Center from the residential neighborhoods to the south. The topography on the north side is a bit more gentle, although there are areas of steep hillsides rising to the plateau of northern Oxford. 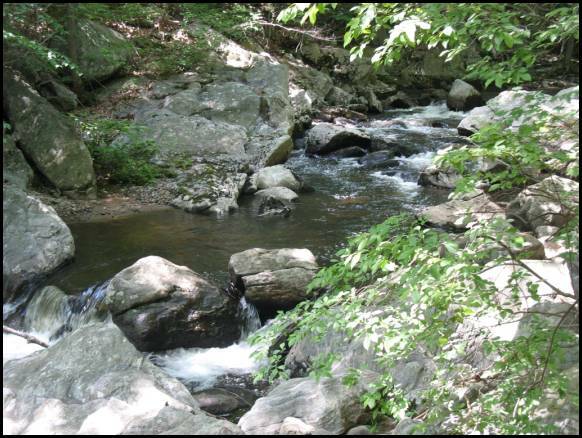 The Little River is a scenic and environmental asset to the area, and helps define its character. At the same time, the watercourse, and its accompanying flood plain and wetlands, do limit potential development that may be beneficial to the Center. Within the western area of the Center, the Little River runs near Route 67, allowing only a narrow area of non-wetlands, along the road. This prevents any significant level of development from occurring there. Further east, the river is behind the properties fronting on Route 67. However, it is still a barrier and constraint to any significant type of development within the area. The river also limits the potential for use of the town –owned open space on the south side of Route 67, across from the Town Hall. Improvements would require a crossing of the Little River and the associated wetlands. The land rises sharply immediately to the south, and its slope and topography would make any substantial improvement difficult. A key characteristic of any successful, functional town or neighborhood center is the ability to “park once” and walk around the area to the various destinations. Oxford Center lacks any pedestrian circulation system, as there are no sidewalks along Route 67 linking the various components and uses with Oxford Center. Most town centers in Connecticut grew and evolved around an intersection of at least two major roads, linking the community with surrounding communities. These roads are now usually state highways. Nearby examples of this are easy to find; Naugatuck; Routes 63, 68 and 8; Beacon Falls; Routes 8 and 42; Seymour; Routes 67, 313 and 8; Southbury; Routes 67, 6 and 84; Prospect; Routes 68 and 69; etc. Although Routes 42 and 67 intersect in Oxford Center, Route 42 is a minor road and does not access much of Oxford. Much of the Oxford community is southwest of Oxford Center, and there are no major through roads that connect Oxford Center with the entire western section of Oxford. Town roads, such as Governors Hill Road and Hogs Back Road provide the principle connections to the central and west areas of Oxford, but these roads are hilly and narrow, and not up to standards of state highways. Consequently, residents in the western sections of Oxford, along Route 188, are not well connected to Oxford Center. Busy town centers are naturally located at the junction of at least two major highways, as the location can benefit from accessibility from different areas of the community. Oxford Center does not enjoy this level of accessibility. Despite the historic buildings and environmental attributes, Oxford Center does not present a favorable visual image. When approaching from the northwest, the entrance is defined by the bus garage. Although there are no such negative images when approaching from the south, the visual image lacks the unity and cohesiveness that would let people know that they are entering a special place. There is no public water or sewer service in Oxford Center. The need to provide on-site water and sanitary waste disposal for each individual property limits the potential intensity of development that can occur on the site. Sanitary sewer service has been extended up Route 67, and the Town’s utility service plan calls for an ultimate extension into Oxford Center. In addition, the area contains overhead utility wires that detract from the historic character of the area. Oxford Center has maintained its role and importance within the community as the Town’s governmental center. This is currently its most important role, and should be continued as a primary function into the future. One of the important characteristics of Oxford Center is its historical character and role in the history of the Town. The historical components of this area are primary assets of Oxford Center, and should be a principal component of any sustained improvement effort. Commercial uses are commonly located within most community centers or downtown areas. Oxford Center has been unique in that it contains few commercial uses. The major commercial uses within Oxford are further south along Route 67. It is not feasible that Oxford Center will ever be a major commercial center of the Town, because of environmental limitations, lack of developable land and existing land use patterns. The goal of maintaining the existing character of the area would prevent any intensive or large scale commercial uses. However, the introduction of limited, small scale commercial uses can enhance the character of the Center, by serving as an additional attraction and reason for people to use the center. The intersection of Routes 67, 42 and Riggs Street have been realigned several times over the course of the past several decades. An early realignment left a stretch of road east of the Victory Park, which serves a shortcut between Routes 42 and 67. The intersection was reconstructed several years ago, in conjunction with the reconstruction of Riggs Street. The Riggs Street and Route 42 intersections with Route 67 were separated, creating a small parcel of land between the roadways. As traffic increases within the area, additional improvements to the intersection may be necessary, including the introduction of a traffic signal. It may be advisable to close the old state highway at one end to reduce traffic evading the intersection. The presence of the Oxford Center School reinforces the governmental presence in the center, and its role as an activity center. However, the overall makeup and status of the school is being evaluated, and the future use of Oxford Center School is uncertain at this point. If its use as a school no longer meets the needs and plans of the Board of Education, there will be opportunities for re-use. One promising option is for it to be used as the Town Hall. Many communities have successfully adapted a school building for use for municipal offices. This would free up the existing Town hall for re-use and/or private redevelopment. It could be redeveloped into a small scale office – retail complex, or re-used for governmental functions such as an expanded library or recreational / senior center. The site includes considerable land to the rear of the building which could be used for recreational or community purposes. The analysis of the strengths indicated that the two of the most important strengths are the Town Greens, Little River and Kirks Pond. These can all be weaved into a greenway system that creates important public spaces and links them with a system that would befit Oxford’s rural heritage. The role of Oxford Center within the community has evolved over the years. This evolution continues and change is required to improve the area and make it an important and vital component of a growing, contemporary community. The role should reflect the collective vision of the Oxford Center stakeholders. In order to meet the needs of the twenty-first century, Oxford Center needs to become more of a gathering place and focus for the community. This includes Improvements to make the area more comfortable for residents, and the creation of facilities and businesses that would attract more residents. At the same time, the historic and environmental characteristics of the area must be maintained and enjoyed. Although the area has inherent strengths, generally, it is not a place that people feel comfortable spending much time there, other than a specific destination. People tend to spend the minimum amount of time in Oxford Center to accomplish their task, whether it is to conduct municipal business, go to church or attend school. There are several important components to making Oxford Center more of a community gathering place and focus. There are no accommodations for any pedestrian activity in Oxford Center. The area has no sidewalks or walkways. Walking along the road is uncomfortable and sometimes dangerous, as vehicles travel at high speeds despite the 25 MPH speed limit. The stretch of Route 67 within the Center contains no traffic control devices that would enable a pedestrian to cross the road. A system of sidewalks and walkways is needed. It should include a sidewalk along the northeast side of the street between Town Hall and Riggs Street. Pedestrian circulation on the southwest side of the street could include a combination of on-street walkways and a path along the river. There should also be internal walkways connecting nearby facilities, such as the Center School, Kirks Pond and Town Hall. The growing population of Oxford is creating new business opportunities. The town is experiencing a great deal of retail “leakage;” residents leaving town to conduct business. Additional business development would enhance the role of Oxford Center as the focus of the community, as it would create another reason for people to visit the center. However, the physical layout, residential character and historic characteristics of the area make it imperative that any retail or related uses be small-scale in nature, and of a nature that is consistent with the historic and residential character. Although there are some limited opportunities for new construction to accommodate businesses, the emphasis should be on the continued re-use of the existing buildings within the area, with continued strict standards for site design. Any new construction should be of a scale and quality so that it also blends into and enhances the area. The commercial uses should be small scaled and respective of the historic and residential character within the area. Art galleries, professional offices, studios, antique shops and similar uses would be appropriate within this area. The current Oxford Center zoning permits a limited range of commercial uses in existing buildings. However, some new buildings may be appropriate, such as on the vacant parcel on the north side of Route 67, just west of the intersection of Riggs Street. 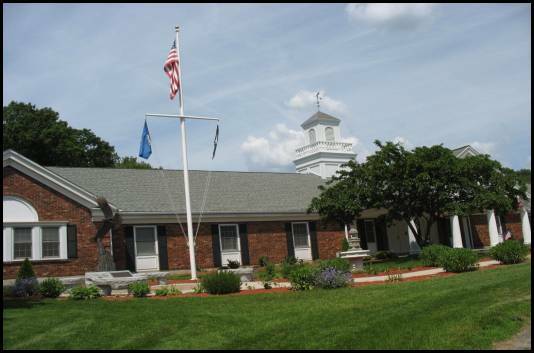 The role of Oxford Center will be strengthened by locating the future municipal facilities within the town center, including the library, senior center and expanded town hall. However, for some facilities like the police station, other locations within the Town may be more advantageous. Similarly, the churches are important components of the center, and should remain. The key to making Oxford Center a more interesting and inviting place is to create a system of parks and greenways within the area, essentially an open space ribbon through the area. The ribbon would tie the area together, linking activity centers with open space resources. These open space resources should include Kirks Pond, the Little River, the land behind the Town Hall, and both Town Greens. Oxford Center has a strong heritage that should be utilized in its improvement efforts. Many of the homes and churches in the area are historic. The Green and the surrounding buildings encompass a unique and valuable historic resource. Any improvement efforts should be based upon and respective of the historic character of the area. Even with pedestrian improvements, vehicular traffic will continue to dominate in and through Oxford Center. The area needs to be better defined, with entrance features that let everyone know that they are entering a unique area of the community. Oxford Center, along with other sections of the Route 67 Corridor extending south towards the Seymour town boundary should be considered as the “central spine” of Oxford. Although Oxford Center is not the central retail area, it is part of the corridor which collectively provides much of the focus and activity of the community. Therefore, future land use decisions should be made to reinforce this role. Oxford Center should be viewed as the historic and civic anchor to this corridor. There are recommendations for each of the sub-areas of Oxford Center, as well as general area wide recommendations. The recommendations are physical, programmatic and regulatory, to provide a multi-faceted approach for the renewal of Oxford Center. a. Install an entrance feature at the south end of Victory Park to inform motorists that they are entering Oxford Center. This should include a sign and distinctively landscaped area. b. Maintain the homes along Old State Highway as residences. 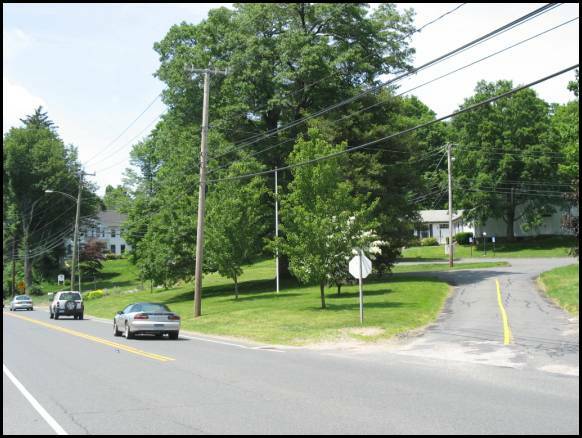 c. Landscape the “leftover” parcel of land between Riggs Street and Route 42.
d. Request the State Department of Transportation to investigate the feasibility of a traffic light at the intersection of Route 42 and/or Riggs Street. e. Permit limited non-residential uses on properties along Route 67. This area is what is perceived when people speak of Oxford Center. It includes the green and surrounding historic areas, as well as both churches. It includes the area between the Center School and the intersection of Riggs Street. The area includes some historic non-residential uses, but is still dominantly residentially in character. § Open up views of the Congregational Church, possibly by select tree trimming or removal. § Create pedestrian linkages between the Green and other areas of the Center. § Allow for the use of the homes along the Green for certain limited non-residential uses, such as a Bed and Breakfast, or professional office. This may require some relaxation of the parking requirements. b. Consider permitting the development of the vacant parcel on the northeast side of Route 67, across from Dutton Road for a small scale commercial development. The development should incorporate careful architectural and site design that is in conformance with the historic character of the area. c. Install landscaping between the Oxford House parking lot and the road, to reduce the visual impact of the parking lot. d. When a new Police Station is constructed, reuse the existing building for office or small scale retail uses. The site has room for additions, but the parking areas should be well landscaped and shielded from view from the road. Re-use of the site may require demolition of the existing building and reconstruction. Should that occur, the new development should be designed is a scale and style consistent with the historic context of the area around the Green. e. Permit the use of the existing homes for limited retail and office uses. a. 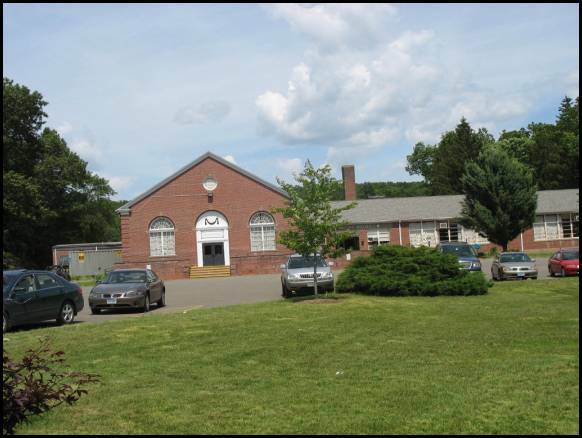 The Town Hall should remain within Oxford Center; either at it existing location, or at the Center School, if the Board of Education decides that the Center School is no longer needed or appropriate for educational needs. b. 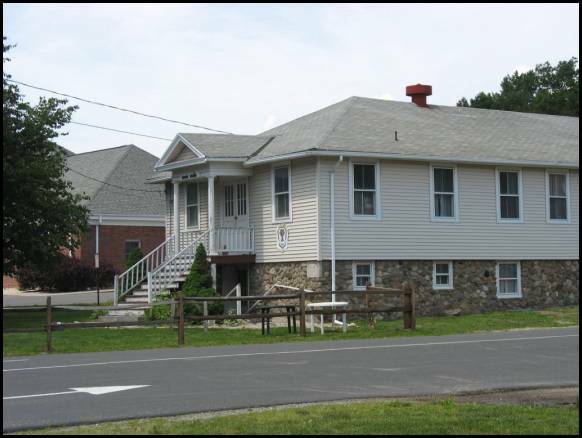 If the municipal offices are moved to the Center School, and the existing Town Hall building is not needed for other municipal purposes, the existing site of the Town Hall should be redeveloped into a retail commercial area, with a village like character. This may require the demolition of the existing Town Hall. c. Kirks Pond should be improved into the principal town green in the area. It should be designed and improved to be the primary outdoor public space in the community, and a focus for community activities. d. If the Center School is reused as a Town Hall, the area behind should be integrated into the overall center park system. e. The lands behind the Town Hall and across the street from the Town Hall should also become part of the overall center park system. They can serve as a base of a trail system through Town open space. a. Village District Regulations - Village Districts are specially enabled by State Statute to provide a higher level of review for specially designated areas of the Town. It offers the opportunity for a higher level of architectural and site control. The jurisdiction would also apply to public rights-of-way, including the State Highway. Oxford Center would be eligible for the creation of a Village District. The statute states that the village districts must be located within areas of distinctive character, landscape or historic value that are specifically identified in the plan of conservation and development of the municipality. The adoption of Village District regulations would enable the regulations of the design and placement of buildings, maintenance of public views, design, paving materials and placement of public roadways, and other elements that the Planning and Zoning Commission deems appropriate to maintain and protect the character of the village district. This higher level of review would enable changes in use in Oxford Center, in accordance with the Village District Controls. b. The current Oxford Center zoning regulations permit limited commercial uses in existing buildings, with minor additions. The regulations should be amended to permit more commercial uses within Oxford Center, with strict architectural and site guidelines. c. The zoning regulations should include lower parking requirements for business uses within Oxford Center, and also include incentives for shared parking. Parking areas should be visually deemphasized, with screening from the road. The goal should be to encourage use of the municipal parking facilities and minimize parking impacts within the historic core. § Greenway and paths along the Little River. § Enhancement of Kirk’s Pond to serve as the Town Green within the municipal area, with linkages to the Center School and Town Hall. This area should be designed to serve as a central feature of Oxford Center. § Improvement of the Church Green to open up views of the Congregational Church. § Creation of an entrance feature at Victory Park that lets people know that they are entering Oxford Center. 1. Install sidewalks along both sides of Oxford Road between Town Hall and the Church Green. 2. Extend sewer service up Route 67 as far as the Town Hall, and provide sewer service to the properties within Oxford Center. 3. To the extent feasible, new and expanded municipal facilities that provide services to residents should be located within Oxford Center. Although there may be significant financial reasons to construct a new library further up Route 67, other municipal facilities such as a senior center and expanded Town Hall should be located within Oxford Center. 4. Work with the State Department of Transportation to install a traffic signal at the intersection of Riggs Street – Route 42 and Route 67. 5. Work with the State Department of Transportation to install a crossing walk signal in the vicinity of the Center School in conjunction with the construction of sidewalks. This can be done in conjunction with installation of the sidewalks. 6. 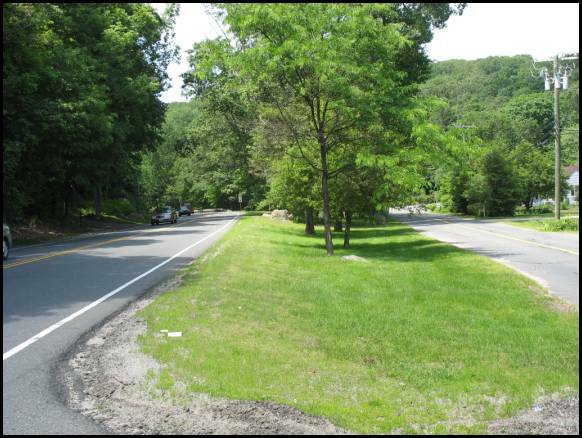 Provide a systematic planting scheme along Route 67 within Oxford Center that includes street trees and ground plantings. 7. Any center revitalization or enhancement efforts require an entity to advocate for the interests of the businesses and property owners within the area. Unlike other centers or downtowns of larger communities, Oxford Center has not had a strong identity that would foster the creation of this type of group. However, within the long term planning horizon, this type of group can be effective in furthering the unique interests of Oxford Center. In order to begin the process of advocacy for Oxford Center, the Oxford Economic Development Corporation should establish an Oxford Center working committee, whose role would be to further implementation of the recommendations of this plan. 8. It is generally accepted that revitalization of downtown areas within large and smaller communities are significantly enhanced by residential development in or near the downtown area. This provides a market for downtown businesses, and enhances the role of the area as a 24 hour activity center. Oxford Center is not a downtown, in the sense of communities such as Naugatuck, Seymour, Derby, Ansonia or Shelton. However, some additional residential population within close proximity of the Oxford Center would enhance its role as the community center. It is important that this residential development occur in a design and scale that is consistent with the overall character of the community. Age-restricted housing, at a slightly higher density than otherwise permitted in Oxford has proven successful and consistent with overall planning and land use goals. Therefore, the zoning regulations should provide for age-restricted housing, at higher densities than otherwise permitted near Oxford Center. The extension of sewer service into this area would facilitate this type of development. The following is a draft amendment to the Town of Oxford Zoning Regulations that incorporates the recommendations of this Plan. It includes the establishment of a Village District, in accordance with Section 8-2j of the State Statutes. Additions are underlined and deletions are crossed out. The following regulations shall apply to the use of land, building and other structures and the location and bulk of building and other structures in the Oxford Center District. The purpose of this regulation is to permit certain nonresidential uses that would be compatible with the current residential uses, provide for the continued economic use of this area, protect and enhance its unique character and contribute to the economy of the Town by a greater economic utilization of the center of Town. 1.1 Authority – The regulations for the Oxford Center District shall be considered a Village District in accordance with the requirements of Section 8-2j of the Connecticut General Statutes. 2.1 All uses permitted in the Residence A District as specified in Article 5, Section 2. 3.1 All uses permitted by Special Exception in the Residence A District as specified in Article 5, Section 3. 3.2 Business and professional offices. 3.3 Retail stores and shops for the sale of antiques, gifts, clothing or other type of retail establishment, that in the opinion of the Commission, would be consistent with the historical and residential character of the area with respect to levels of activity, generation of traffic and hours of operation. 3.4 Undertaker establishments and funeral parlors. 3.8 Restaurants and inns, that in the opinion of the Commission, would be consistent with the historical and residential character of the area with respect to levels of activity, generation of traffic and hours of operation. SECTION 4 Applicability and Standards. The following standards shall apply to all special exception uses specified in Article 8A, Section 3, except those uses permitted as per Article 8A, Section 3.1. 4.1 No parking areas shall be located between the building and the public right-of-way, except the driveway. 4.2 All parking areas shall be shielded from view from the public right-of-way and adjacent properties through the use of evergreen hedges, lumber fence, masonry walls or other measure determined to be suitable by the Commission. 4.3 All parking areas shall be setback a minimum of 10 feet from all side lot lines and 15’ from the rear lot line. The Commission may waive the setback when the adjacent property is being used for nonresidential purposes and a common parking area is used. 4.4 These uses shall utilize existing buildings. The Commission may permit the expansion of an existing building or the construction of a new building if it finds that the architecture of the new construction is compatible with the historic architecture within the area. 4.5 All signs shall conform to the requirements of Article 16, and shall reflect the historic nature of the area, in the opinion of the Planning and Zoning Commission. No internally illuminated signs shall be permitted. 4.6 All other requirements of the Residence District A shall apply. 4.7 All uses by Special Exception shall utilize buildings that exist at the time of the adoption of this regulation. Such buildings, if they contain less than 2,500 square feet of floor area, may be enlarged so that the special exception use occupies a maximum of 2,500 square feet of floor area, if, in the opinion of the Commission, the expansion of the building will not detract from the historical and residential character of the area. All additions and alterations to existing structures shall be consistent with the requirements of "Connecticut Historical Commission- The Secretary of the Interims Standards for Rehabilitation and Guidelines for Rehabilitating Historic Buildings." (d) That the removal or disruptions of historic traditional or significant structures or architectural elements are minimized. (7) The scale, proportions, massing and detailing of any proposed building shall be in proportion to the scale, proportion, massing and detail in the district. All ground area which is not covered by building, paving or natural vegetation, which has been disturbed by construction, shall be graded to a slope not steeper than 1:3 and planted and seeded so as to establish a permanent ground cover which will enhance appearance and inhibit erosion of soil. The landscaping shall be designed to promote the historic and residential character of the area.